Is sharing part of your content strategy? I can’t believe that in mid-2016 I am still complaining about this, but it happened to me again just this morning. I came across an interesting blog post about–get this–content strategy, and it had NO SHARING BUTTONS. None. Zilch. There was no easy way to share this content out short of me cutting and pasting the URL or using an extension such as Buffer (as Jonathan Rick helpfully pointed out on Twitter). Here’s the thing, content strategy is supposed to keep the “user experience” (or UX) in mind. That means, that you, the content strategist or website/blog owner, need to think about your site’s visitors: How do they use your site? What do they need to do on your site? What do they want to learn about you? How can you make the process easy and intuitive for them? Sharing buttons have been around for years. There are dozens of plugins that allow this functionality in WordPress, and I am sure in any other blogging platform. Not having sharing buttons means you do not want your content to be shared. Which means you do not understand the purpose of content or the social aspect of social media (blogs are social media). It’s not difficult: Your content strategy needs to include an easy way to share content. And by the way, sharing content also includes being able to email it or print it (don’t get me started on how many recipe sites don’t have this functionality). You will find sharing (and printing) buttons at the bottom of this post. Please consider sharing this so that we can get all the non-sharers on board. As a huge fan of British mysteries, I am always reading books by authors such as Peter Robinson, Peter Lovesey, Ann Cleeves, and Ian Rankin. And I watch many British detective shows such as “DCI Banks,” “Inspector Morse,” “Lewis,” and “Vera.” Many of these shows are directly based on British authors’ books (“Vera” is based on Ann Cleeves’ Vera Stanhope series), or based on the characters developed by the authors (Colin Dexter’s character Inspector Morse has inspired three TV shows: “Inspector Morse,” “Lewis,” and “Endeavour”). Last Friday, I finished reading Ann Cleeves’ “Harbour Street” and coincidentally (weirdly, really), the “Vera” episode (“On Harbour Street”) that aired Saturday on WETA UK was based on that very book! It was a great opportunity to see how the TV adaptation of the book stacked up– what was the same, what was different. The main premise of the story was exactly the same: an older woman, Margaret, is stabbed on the Metro. Chief Inspector Vera Stanhope’s sergeant, Joe Ashworth and his daughter are on the train when the dead woman is found. Vera investigates, leading her to a house on Harbour Street in the the town of Mardle, where the murdered woman lived. Vera pursues the investigation by talking to several people who knew the victim. Most of the main characters are the same: Vera, Joe, Margaret, Kate, and Dee (Margaret’s friend, an alcoholic prostitute). Other characters are different or even completely eliminated. For example, in the book, Vera has a constable named Holly, but in the TV adaptation, her name is Shep. Also, last names are different for many of the characters. The TV episode follows the same general plot as the book but eliminates a few side stories (e.g., a burning down of a building for insurance purposes), changes several details (e.g., Dee falls to her death in the TV show whereas she is stabbed in the book) and even has a different murderer (not going to give that away!). The action in the book takes place right before Christmas and it is cold, snowy and the roads are icy. In the TV adaptation, the action is set in what could be summer (or late spring, early fall). Content marketing is essentially re-purposing content, that is, taking various types of informational material (for example: a how-to video, a news article) at your disposal, and using it in different ways to help market your product or advocate for your cause. How do you re-purpose content? When you re-purpose content, you are generally taking material that was produced for a certain purpose and/or medium (e.g., a long-form article in a trade publication) and you are adapting to a different purpose and/or medium (perhaps a blog post). If you want to adapt or re-purpose content successfully, you can learn from what the “Vera” screenwriters did with “On Harbour Street.” Basically, they took a 376-page book and made it fit the time and story constraints of a one-and-a-half hour TV show. To achieve this, they concentrated on the main character, Vera (since she’s the title character of the TV series), while cutting out non-essential stories and extraneous characters. Perhaps because it is easier to film outside during the warmer months, the timing of the action was changed from winter to summer. What are the content’s most important points or key messages? 2. 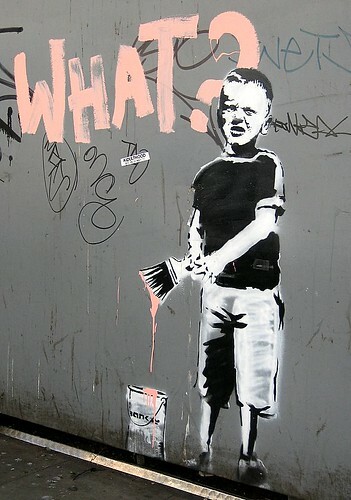 Understand the medium where the content is to be re-purposed. What are the length/time/space constraints? When is the content going to appear? Will you need graphics or better explanations? Who will be accessing the content? How will they be accessing the content? How are they different or the same as the audience for the original content? Bottom line: To re-purpose any type of content, you must be able to maintain the content’s original meaning while making it relevant to new audiences and different media. What does the customer have to know? 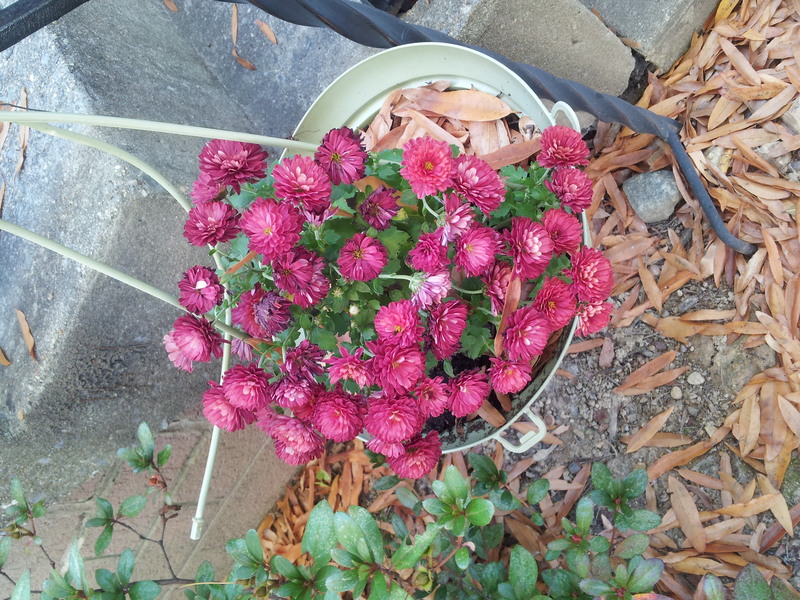 This weekend I noticed the mums in front of my house were looking a bit sad…all droopy and discolored. Apparently, they were in dire need of watering. What do dying mums have to do with marketing communications? Let me tell you. A couple of weeks ago, I bought these mums at my local farmer’s market . I asked the farmer/vendor how long they would last. 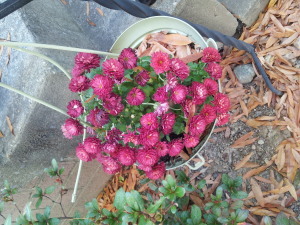 She told me that mums are hardy and should last through Thanksgiving, providing some color as the flowering annuals die. But at the rate my mums were going, they wouldn’t make it to Halloween. So this past Saturday during my weekly visit to the farmer’s market I asked the vendor about the mums: Should I water them or would it be OK to wait until it rained on Sunday? She told me that I should most definitely water them as soon as I got home, because mums need a lot of water. Well, then. I had made the incorrect assumption that because mums are hardy plants, it meant they needed little water. If, when I bought them, she had mentioned that mums should be watered frequently, I would have done so. But she hadn’t and this is exactly the type of information I needed to know to help my plants survive. Customers don’t know what they don’t know. Period. It’s your job as a marketing/communications person (let’s include sales under marketing here) to make sure they have the information they need to use your product or service appropriately and get the most out of it. Customers don’t know your product or service as well as you do. You are the real-life expert on your product or service. You know what it does, how it does it and why. What does the customer/ client have to know about my product or service? Once you have the answer to this question, your content marketing, copywriting, and especially your customer/client interaction, will all be easier. If you need help figuring out what your customers should know about your product or service, get in touch! I can help. Content must be the buzziest term in the communications /marketing field right now. Everywhere you turn it seem you find discussions of content strategy and marketing. There are articles on how to create or re-purpose content. There are discussions on what is the best content and what channel is it ideally shared on. But is content marketing absolutely necessary for you to achieve your business objectives? the practice of creating relevant and compelling content in a consistent fashion to a targeted buyer, focusing on all stages of the buying process, from brand awareness through to brand evangelism. Basically, you create content in order to sell something (your ideas, your product, your service) or obtain something (support). I agree wholeheartedly with the theory that you should be providing information for your potential customers or supporters to make informed decisions. I am a huge fan of blogs in particular as an easy way to create and share content. That said, how do you explain the success of a content strategist I know who doesn’t even have a website, much less “content”? Or the digital media expert who has so much work she hasn’t blogged in months? Or the public relations agency that last tweeted in 2012? And then there are the many successful small businesses (e.g., plumbers, caterers, etc.) that may have websites but that don’t usually have the staff, budget or time to handle blogging, tweeting, creating infographics, etc. 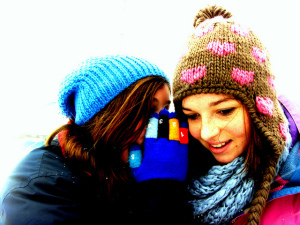 Whispers by coolio-claire on Flickr. Creative Commons license. Here’s the other thing: content is not always online. Content— a fancy word for information—can be shared face-to-face, in person. What you say to others about your business helps to market your business. This is why we develop key messages and elevator pitches. This is why we attend networking events. This is why we host coffees and get-togethers. The bottom line is that content marketing works, but it is not always the online and social media versions that are the most successful. How high is your website’s barrier to entry? Recently, I came across an article about how the Jewish online magazine Tablet is dealing with comments. It has decided to charge a fee to allow people to comment in order to make it harder for trolls to post obnoxious (and often anti-Semitic) comments. But there is an unintended consequence, and that is that legitimate commenters will now be dissuaded from commenting as well. The barrier to entry may prove too high. Have you ever thought about how a visitor interacts with your website? What does that person need to do to find what he or she is looking for? What information is crucial and how easy is it to access it? If you have been seeing a low conversion rate on your website, a drop in visitors, or a high bounce rate, perhaps you need to examine whether you have created an unintended (and intangible) barrier to entry or have built a barrier to entry that is too high. Many websites have barriers to entry. Some are easily “climbed” and some are like Mount Everest, impossible. Generally, these barriers include “mechanical” barriers such as subscription fees, sign up forms, or registration requirements. Some barriers are more subtle, intangible, but still make it hard for visitors to access your content. In an effort to generate revenue from online readers, newspapers have added online subscription fees. That’s a high barrier to entry, since visitors will not only have to sign up, but provide payment. Some websites require registration, generally your email and a password. That’s also a medium barrier to entry. Yet other websites splash a newsletter sign-up before you can read the content, but generally you can close that out making it a low barrier to entry. There are good reasons to create these barriers. After all, you may want to grow your marketing database or get some insight into who is visiting your website, or like many newspapers, you are looking for a source of revenue. But barriers are not just mechanical or even visible. Your barriers to entry may be intangible and psychological. By that I mean that your barriers are tripping visitors’ heads. For example, your website navigation may not be intuitive or clear and may make it hard to for visitors to find what they are looking for. Another hard-to-quantify barrier is the language that you choose to use on your website. Many tech and government websites are flush with jargon that is nearly unintelligible to an outsider. Some websites make it hard for visitors by having too much content or information to sort through. Have you ever landed on a page that made your eyes and head hurt from information overload (or worse, visual overload)? Then you probably know what I mean, and I bet you just went elsewhere. How would you classify your website in terms of barrier to entry? High, medium or low? Is it what you want or are you unintentionally turning visitors away? Last week, for my eight-week summer challenge post, I challenged you to clean out your social media channels, such as your RSS feeds. I did some cleaning myself, and I finally removed Mashable from my feeds. It’s been there for a long time but I haven’t been reading it for ages, and just marking everything as read without so much as scanning it. Do you see anything about about social media? Well, perhaps I scroll through the home page I could find a couple of articles about social media, but they are lost in the morass of lifestyle, career and general news articles. Some of these wide-ranging articles are potentially very interesting (and shareable), but not what I subscribed to Mashable for. And, to make matters worse, Mashable’s feed was overwhelming. There were around 60 new articles each day. In fact, we see one or both issues crop up in what I consider ineffective content. With the first issue, too much content, you are overwhelming your readers. You are giving them so much that they end up not reading any of it. For example, I see this happening with Inc. Magazine’s RSS feed. Every day, there are dozens of new articles. Too much. With the second issue, the “wrong” content, you are not providing readers with the content they want or need. I see this happening a lot, especially for websites/blogs that usually put out business/marketing advice and that are now peppering this information with self-help and self-improvement tales. Now, I have absolutely nothing against self-improvement, but I don’t go to Marketing King John Doe to find out how to be happier or fitter. There’s only one solution to these content issues and that is to respect your readers. You don’t want to overwhelm your readers, and you want to make sure to respect their time. Too much content makes it hard for them to figure out what is important, what they should read. You should further respect your readers by providing them with the information they want and need. What do you think? Are you swimming in a sea of content and looking for the nearest island? Or are you finding just enough content and all of it relevant to you? If you ever watched the TLC show What Not to Wear, you know some people choose to wear cringe-inducing outfits when left to their own devices. It generally takes an ambush by the show’s hosts, disapprovalof the person’s loved ones, and a look in the three-way mirror for the fashion-challenged individual to consider changing his/her look. In other words, sometimes you need an outside perspective. Pulling a bait and switch. You tell readers you have five tips for doing something but in reality you want them to buy your e-book or webinar. Not cool. Selling. You can funnel your readers to something you are selling, after you have given them value. In other words, your blog post is not advertising copy. Letting down your readers. If your headline promises the ten best ways to do something, then you should deliver those ten tips. Making readers cringe at your inability to use spell-check (or understand grammar). We all make mistakes, and we all forgive one or two typos and grammatical slip-ups, but there’s a limit. Not understanding how people read on the web (or on mobile). Your post consists of a single paragraph, no breaks, no bolding, no graphics, no bullet points, nothing. And it is really long. The web makes people scan content (so make your content scannable!). Closing off comments. Why be social if you don’t want people to interact with you? You can and should have a comment policy, and you don’t have to approve every comment, but do have a way for people to interact with your blog post. Being jargon and buzzword crazy. Few things make me want to scream as much as a blog post filled to the brim with buzzy phrases and cliched jargon (“try to find your sweet spot by selling the c-suite on the low hanging fruit…”). What would you add? Tell me in the comments, which I moderate but always check and respond to! Want to have an effective blog? Attend the next How to Write Your Blog workshop on November 12 in Washington, DC. Get more details and register today! Early registration prices available until Friday.